Tango Bear was chosen to be the children`s Sabbath guest. Every Friday he`d say goodbye to his friends: Bingo the dog and Choppy the rabbit, and spend the weekend with one of the children from the kindergarten. Then he`d tell his friends about the wonderful things he`d seen outside. Sometimes funny things happened to him and sometimes dangerous things. At the amusement park, he almost gets forgotten on the lawn. He makes it all the way to the beach but hurts himself at a bonfire in the woods. 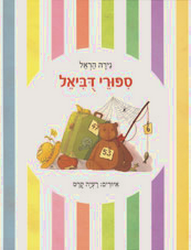 At Daria`s house, he gets mixed up with an identical bear, and at Yuval`s he falls in love with a panda named Mishi. And then, one weekend, burglars break into the kindergarten, and his two friends finally have an interesting story to tell him! In these delightful stories, the toys` point of view gives children a whole new outlook on their world.